A few months ago I posted about the release of the Colonial Gothic: Lovecraft sourcebook. The shadow of the Colonial period looms over much of Lovecraft’s writing, reflected in his descriptions of Innsmouth and Arkham and taking a more active role in stories like The Case of Charles Dexter Ward and The Dreams in the Witch-House. At an early stage in its development, Colonial Gothic itself was pitched to Chaosium as Cthulhu 1776. 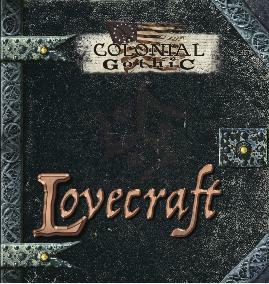 With the release of Colonial Gothic: Lovecraft, players can experience black-powder fantasy adventures against the horrors of the Cthulhu Mythos. With the return of Greg Stafford and Sandy Petersen to Chaosium, the original Lovecraftian tabletop RPG looks set for a new lease on life. Based on Chaosium’s excellent Basic Roleplaying ruleset, Call of Cthulhu has been the leading Mythos-based RPG since it first appeared in 1981. 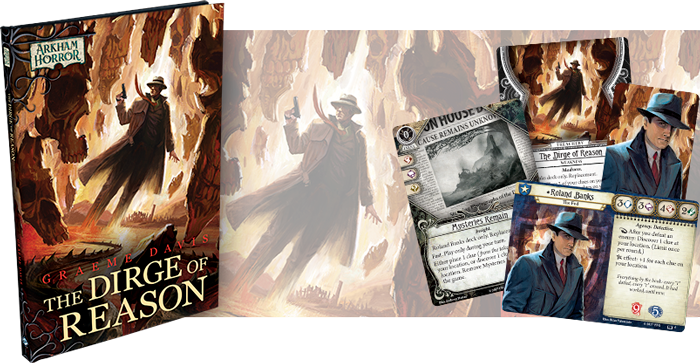 Colonial Gothic is new by comparison, but the game’s core books can offer Call of Cthulhu players and Keepers the chance to explore the dark past of Lovecraft country. One of my major concerns while developing Colonial Gothic: Lovecraft was ensuring that the game stats for the Mythos creatures were accurate and playable. I’m not ashamed to admit that I used the Call of Cthulhu rulebook as a reference, and while it was not the only factor in developing the creature stats, it proved a very useful numerical benchmark. I came up with the following rough system for converting between Call of Cthulhu and Colonial Gothic, and I am sharing it here because I think it could be useful to players of both games. Many other sourcebooks and adventures are available in print, PDF, ePub, and Kindle formats. SIZ: generate from scratch, referring to similar characters/creatures in the Call of Cthulhu rules. POW: generate from scratch, referring to similar characters/creatures in the Call of Cthulhu rules. Skills and spells are hard to convert directly because of differences in the two game systems. However, with a little imagination an experienced Keeper should have no difficulty in coming up with numbers that work, based on the attribute scores, the overall concept and the relevant Colonial Gothic skill, spell, and Trait descriptions. A Colonial Gothic GM can use this system to help convert additional Mythos horrors from Call of Cthulhu sources: the copyright status of the Cthulhu Mythos is complex, and limited the range of creatures that could be covered in the Colonial Gothic sourcebook. Resolution: generate from scratch, based on Reason score and POW * 0.5. Vitality = (Might + Vigor) * 2.5, rounding down. Skills, spells, and Traits can be adapted from Call of Cthulhu descriptions. Several new Traits, specific to the Cthulhu Mythos, are listed in the Colonial Gothic: Lovecraft sourcebook. The GM will find additional Traits in the Colonial Gothic Bestiary. The AnyDice converter provides a useful tool for examining probabilities: it converts the results of any dice roll into percentages. To see the probabilities for a 2d12 roll, enter output 2d12 in the top window and click the Calculate button immediately beneath. 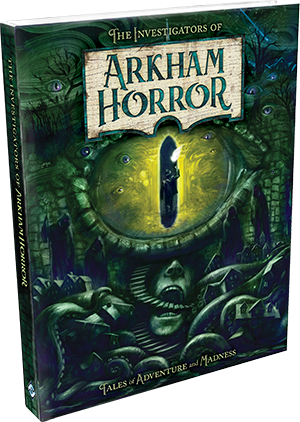 Preorders opened yesterday for the new Colonial Gothic sourcebook, Lovecraft. It is available in PDF, ePub, and Kindle formats as well as the physical book. It’s also something I’ve been looking forward to for some time, and here’s why: it is the first time in almost 25 years that I got to work with Tony Ackland. If you are a fan of Games Workshop’s products from the 80’s, you’ll be familiar with Tony’s work. Tony was instrumental in establishing the look and feel of the Warhammer world, and I worked very closely with him on the first edition of Warhammer Fantasy Roleplay. We also hung out a lot after work a lot, playing Go and talking about everything from World War II aircraft to the campaigns of Napoleon to fossils to classic horror books and movies. A significant quantity of Bass Ale was involved too, I recall. It’s hard to pick a favorite out of Tony’s enormous output from those years, but I was especially impressed by his monster illustrations for the hardback 3rd edition Call of Cthulhu rulebook published under license by Games Workshop in 1986. For many British players, it was the first edition they could actually afford: the earlier boxed sets, imported from Chaosium in the States, were ruinously expensive. When he retired, Tony taught himself to use a drawing tablet by creating pictures of – you guessed it – creatures from the Cthulhu Mythos. Every few days, it seemed, his friends would find another batch of unnamably blasphemous goodness in their email. And that’s when I had an idea. I had been helping Richard Iorio of Rogue Games with the Colonial Gothic product line for a few years. We had talked about a Lovecraft-themed product often. 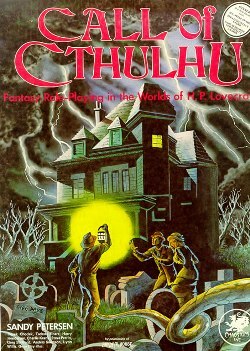 While set in his own “present day” of the 1920s and 1930s, many of Lovecraft’s stories harked back to Colonial times, and in fact Richard had pitched “Cthulhu 1776” to Chaosium before deciding to launch Colonial Gothic through his own company. Tony’s illustrations were an opportunity too good to miss – and I think these new images hold up very well against the Call of Cthulhu bestiary from almost 30 years ago. I’m delighted to see this book come out, for personal reasons as well as professional. The book covers the best-known gods and beasts of the Cthulhu Mythos, but there are many things that we couldn’t touch for copyright reasons (click here for more on the complex copyright issues surrounding his work and those of the other Mythos authors). If you should happen to want to use another Mythos creature in a Colonial Gothic adventure of your own, converting the stats from Call of Cthulhu is a fairly simple matter. Here is a rough method based on creatures that are common to both systems: the GM may need to make minor adjustments according to personal taste and preferred play style, but this will provide a reasonable starting-point. Note: these guidelines are given for personal use only, and are not intended to challenge any copyrights held by Chaosium, Inc, or any other party. Resolution has no directly comparable stat in Call of Cthulhu. I recommend picking something suitable, bearing in mind that the human average is 7. Start with the governing attribute score and adjust according to the needs of the adventure. For more accurate conversions, Call of Cthulhu uses a percentile skill system, so GMs with good math skills can calculate the odds of 2d12 results and come up with a conversion table if they wish. Colonial Gothic non-weapon attacks are attribute-based, so it is easy to assign attack damage. If the GM doesn’t mind a little work, it is possible to derive a damage score by cross-referencing CoC damage with damage from weapons that are common to both Colonial Gothic and Call of Cthulhu (or another Basic Role Playing game, such as Runequest). Most creatures of the Cthulhu Mythos have Fear and Horrific Visage to reflect their effect on an observer’s Sanity. The severity of each of these Traits should be proportional to the creature’s SAN loss rating in Call of Cthulhu. Use the creatures from Colonial Gothic: Lovecraft as a guide. Other Traits are at the GM’s option: the book lists several new Traits for Cthulhu Mythos creatures.